Synchroblog: Crash. This post is part of the Synchroblog fellowship and it's topics. The current "crash" topic is "Memorable roles of Robin Williams over the years." He ended his own life recently, and it seems a fitting way to commemorate his impact on so many lives. Robin Williams filled a wonderful part of my life in a very real way. In this day and age so much time is spent enjoying media, movies. As a child I saw many movies featuring Robin Williams. I most deeply recall his roles in the 1990s. Mrs. Doubtfire of course. The Dead Poets Society. Hook. Good Will Hunting. His cameo on Wilfred was hilarious, more recently. Why would such a wonderful entertainer want to hurt himself? Robin Williams was an alcoholic and addict. It was something he struggled with greatly, and for that reason I am able to deeply identify with his struggle. The problem with alcoholism and drug addiction is not necessarily the drugs or the alcohol or being on those substances. The problem is when the addict is clean and sober, that's when life is really unmanageable. If alcohol or drugs was really the problem, all an addict would have to do is toss them in the garbage and be done with it. The real problem occurs in the addicts mind. Without a true spiritual experience, without Jesus Christ giving me a reason to live, a holy power to regenerate and sanctify my personality, and build me up in new faith, I very quickly become a suicide possibility. That is the way of it. A person is not born into a manageable position, not really. Some people can keep it up longer than others, but the fundamental fact of the matter is that humanity is made for connection with God. That's the truth. That's why atheists wrestle with suicide. That's why nations war. That's why abortion continues. That's why the world is a mess. Humanity is not capable of existing as the power unto itself. It is constant degradation no matter how you look at it! Spiritually, mentally, and most obviously physically. 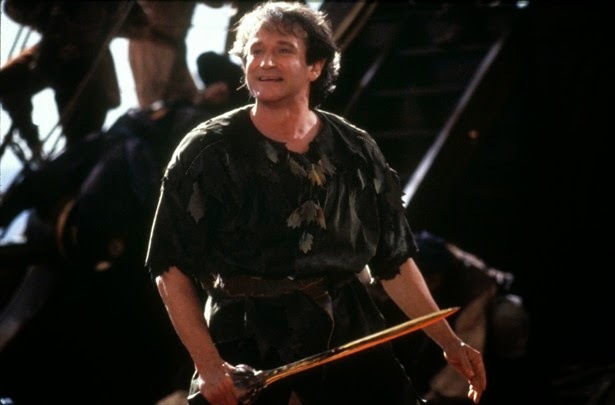 The roll I'll always remember Robin Williams for will be Hook. I loved Hook when I saw it. I was only six years old but I still remember it. I suppose I identified with it because I felt like the kid in that movie. I had a father who didn't know I existed. In a way I ended up joining Hook on his pirate ship. For a long time I was a rebel without a cause, a total mess. My father never came to save me though. I was a long term pirate. But eventually my heavenly Father did save me. Robin William's roll as Peter Banning reminds me of how someone can change, and believe, and become part of a new family. Kind of like becoming a Christian. We won't ever know exactly why Robin Williams chose to commit suicide, but we can remember him for the laughs he gave us over the years. And we can pray for his family.